Updated safety standards for laptop batteries should be in place within the next 12 months, a working group of computer firms has said. The Portable Computer Battery Working Group was set up last month and follows reports of problems with batteries overheating and sometimes exploding. 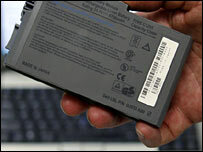 Faulty batteries in laptops made by Dell, Apple, Fujitsu, Toshiba and others were produced by Sony. Batteries in more than 10m laptop computers have since been recalled. The problems affect Sony's lithium-ion batteries which are used in millions of computers worldwide. Analysts have speculated that the problems could cost Sony $500m (£260m) to replace faulty batteries. The problems led to some airlines temporarily banning the use of certain laptops on aeroplanes. Sony apologised for the problems, which prompted a cut in its profit forecast for 2006. Consumers may be persuaded to switch brands because of the reported problems, according to a recent report by analysts IDC. Fifteen percent of corporate buyers and consumers survey said the reported problems had caused them to alter their buying plans.